Here is the $ Ad Spend Grid for Super Bowl XLVIII. 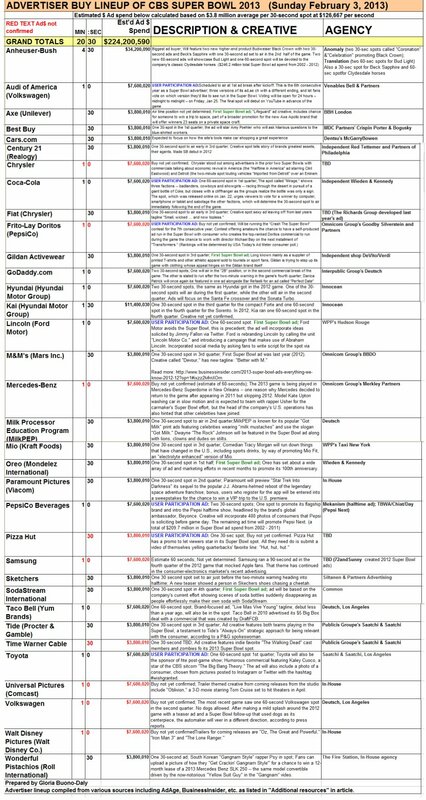 This grid has been revised since last year to include additional information as well as links to respective teaser ads. So far a total of 29 advertisers are confirmed (vs. 36 advertisers last year), which represents an estimated total ad spend of $200 million (estimating a 30 second spot at $4 million). The grid will be updated as additional information is released. Sorry about the jpg quality, awh the limitations of Blogger - unable to embed the actual pdf. For a #FREE quality pdf of the Super Bowl XLVIII $Ad Spend Grid, ( #superbowl ) shoot me an email with "Super Bowl $Ad Spend Grid" in the subject line and I will be delighted to send it over to you. You can reach me at gmbdaly [at] gmail [dot]com. The article below was posted last week (Jan. 22). CBS Sports, Analyst THE NFL TODAY; Pro-Football Hall of Fame (2005) and former American football quarterback, played for Miami Dolphins (NFL). Despite never being on a Super Bowl-winning team, he is recognized as one of the greatest quarterbacks in American football history. 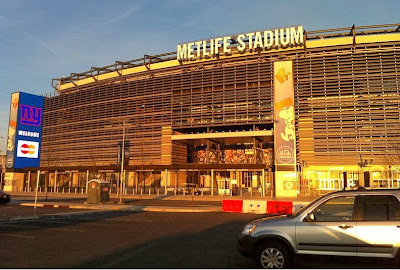 This year, the Super Bowl XLVIII will be held at the MetLife Stadium in Rutherford NJ on Sunday, February 2nd between the American Football Conference (AFC) champion Denver Broncos) and National Football Conference (NFC) champion Seattle Seahawks) to decide the National Football League (NFL) champion for the 2013 season. The National Football Conference (NFC) leads the league with 25 wins to 22 wins for the American Football Conference (AFC) as of Super Bowl 2013. Spectacular, Super Bowl 2014 ads are on YouTube - featured teaser ads from Doritos, Pepsi, Jaguar, Budweiser, etc. By the way, there are other YouTube ads (e.g., Olympic ads, Rocky Broadway Show ad, etc.) in-between but you can click on the "skip ad" located in the lower left corner to view the next Super Bowl teaser. Super Bowl Sunday, known as the biggest day of the year for TV ads, is an American cultural phenomenon. This year it airs on Fox. According to Variety, Fox had sold 85% of its Super Bowl TV ads by late August and has completed its sales for the event the week after Thanksgiving. Since then, Fox has been focusing on selling ads in its digital stream of the game, commercials in pre-and post-game programming and content on Fox Sports 1 in the week leading up to the Feb 2nd event (beginning Sunday, January 26th). 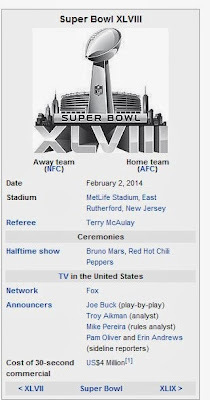 Besides the excitement of the football game and the commercial TV ad spots, FOX 2014 Super Bowl halftime show, as in prior Super Bowl years, will be the most watched musical event of the year. This year features 28-year-old crooner Bruno Mars. 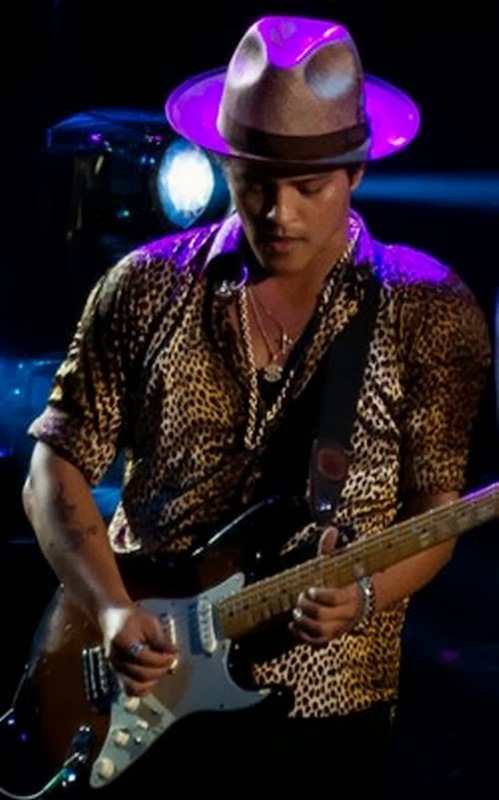 The 18 Grammy Award-winning R&B musician will perform during the Pepsi Super Bowl XLVIII halftime show. Mars will also be joined by one of the most successful rock bands, Red Hot Chili Peppers. More information about Pepsi Super Bowl Half-time show video. In addition to Mars’ 18 Grammy nominations during his short career, Mars amazingly scored his first five Hot 100 top singles faster than any other male artist since Elvis Presley. What do you hope Bruno Mars sings and what tracks would you want Red Hot Chili Peppers will play? Past performers for the halftime show have included Beyonce and Destiny's Child (the electrical system iblack out for several minutes), Michael Jackson, U2, Bruce Springsteen & The E Street Band, The Who, Prince, The Rolling Stones, and Janet Jackson featuring Justin Timberlake (with a special appearance of Janet Jackson's bare breast). How much do these ads really cost? According to the Los Angeles Times, Fox has sold all of its commercial inventory for February's big game for an average of $4 million per 30-second spot, with some ad slots going for as high of $4.5 million (the highest ever for a 30 second spot). This calculates to an average rate of $141,666.66 per second using the $4.25 million per 30-second spot ad rate (since some are paying as high as $4.5 million per 30 second spot). 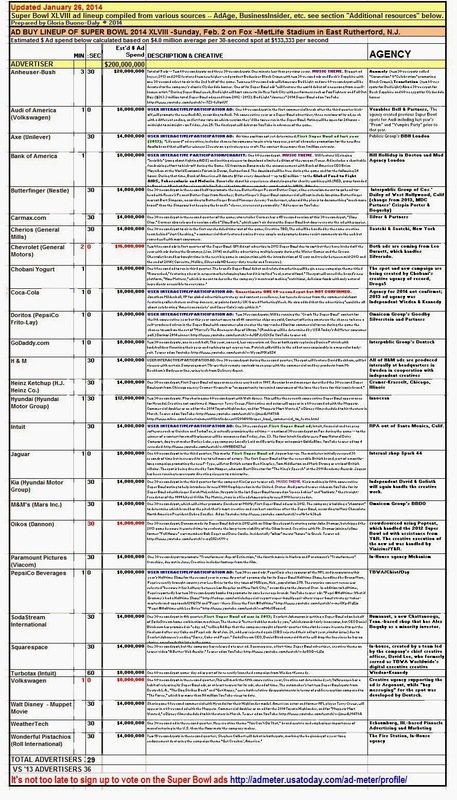 For an updated pdf of the Super Bowl 2014 advertiser $ ad spend grid(sample screen-shot above left from 2013), visit the link to be posted here soon or email gmbdaly [at] gmail[dot]com with "FOX Super Bowl 2014 GRID" in subject line. For all those digitally inclined app nerds, Fox Sports will be broadcasting Super Bowl XLVIII (including Pepsi halftime show with Bruno Mars) on its FOX streaming website and iOS app at 6:30PM on February 2nd. A total of 7 automakers (1 still not confirmed) are expected to advertise car brands during the game versus 9 from Super Bowl 2013. An estimate of 7 new advertisers this year versus 8 debut advertisers from 2013. A marketing trend gaining momentum at Super Bowls are the pre-game teaser ad campaigns. In addition to Axe, Jaguar and SodaStream putting pre-game teaser ads out last month, Pepsi, SquareSpace, Doritos, GoDaddy, and Intuit TurboTax are the latest advertisers to join in (January 17). According to a recent Verge article as a result of all the pre-game hype, YouTube has launched it's first pre-game gallery (January 17th) that includes 7 teasers of ads that will be broadcast during Super Bowl. Although some are still up in the air, the latest advertising recap estimate by category is as follows: 7 automakers, 12 food/beverage, 2 online companies, 2 software financial, 1 apparel and 1 male grooming product brand, 1 movie entertainment. 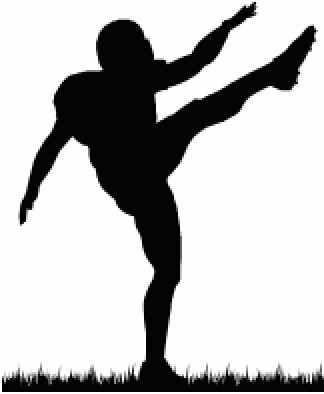 So far I estimate total revenue at $224 million -- this estimate is based on $4.25 million per 30 second spot since some advertisers are paying as high as 4.5 million for a 30-second spot on FOX SPORTS during XLVIII Super Bowl XLVIII. A few new advertisers are promoting healthy food including Greek yogurt with the debut of Greek yogurt manufacturer Chobani and the return (from 2012 debut)of Oikos by Dannon. Also debuting is the famous, heart-healthy cereal, Cheerios (General Mills) and Wonderful Pistachios is returning from 2013 with Gangnam Style artist Psy. The usual including big players, Pepsi and Budweiser (Anheuser Bush) as well as other popular brands Toyota, Volkswagen, are returning to the game this year while others will be stepping out (e.g., E*Trade, Real estate agency Century 21 after past two big games, Cars.com after six consecutive years, GM Ford, Subway, etc.) L.A. Times also reported that Neil Mulcahy, Fox Sports Media Group's evp of sales, said that there would be fewer movies advertised at this year's game. Super Bowl 2014 ads with interactive user experience include the same advertisers as last year -- Audi, Axe, Coke, Pepsi, H&M, and Doritos Frito Lay and newcomer Intuit. 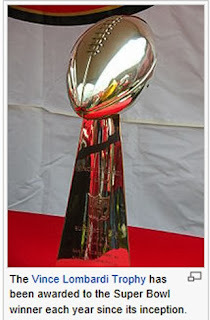 Superbowl 2014 marks the first outdoor, cold-weather Super Bowl and the first time in the New York metropolitan area. This Super Bowl also marks the 7th Fox broadcast (future games on Fox to air 2017, 2020, 2023). CBS holds the record with a total of 18 Super Bowl games (future games scheduled to air on CBS are 2016, 2019 and 2022)and NBC has broadcast 17 Super Bowl games (with future scheduled to broadcast on NBC in 2015, 2018 and 2021). ABC has aired 7 Super Bowl games with no future dates planned. The Pittsburgh Steelers have won six Super Bowls, the most of any team; the Dallas Cowboys and San Francisco 49ers have five victories each; and both the Green Bay Packers and New York Giants have four Super Bowl championships. Also this marks the first time biggest long-time Superbowl advertiser, Anheuser Bush, is hauling in their monumental Bud Light Floating Hotel to a surprise NYC location -- the Hudson River right next to the Intrepid Sea, Air & Space Museum at Pier 88 on the west shore of Midtown Manhattan. The company has a contest for consumers, with the prize a stay aboard the floating hotel.Docking begins in New York on Jan. 30, 2014, for four-days, coinciding with Super Bowl XLVII. The NFL championship will be played directly across the river in New Jersey. The Bud Light Hotel is 10 times larger than previous Bud Light Hotels (which debuted at the Super Bowl four years ago and held about 400 people). 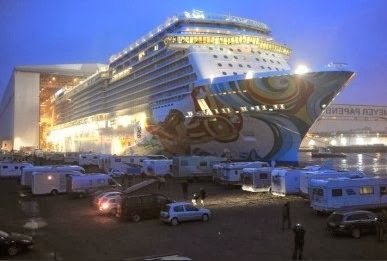 The world’s newest cruise ship can hold more than 4,000 guests in some 1,900 staterooms, and will significantly increase the number of available hotel rooms in the greater New York metropolitan area over the Super Bowl weekend. When the Super Bowl is over and guests have left, the $900 million Getaway sets sail again Feb. 6 for its home in Miami. 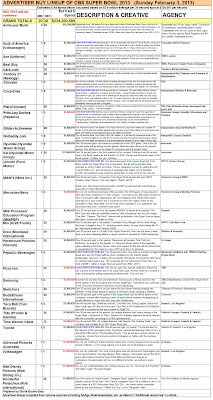 To request a pdf of the Super Bowl 2014 advertiser $ ad spend grid(see snapshot above from 2013), simply email gmbdaly [at] gmail[dot]com with "FOX Super Bowl 2014 GRID" in subject line or come back later for the direct link for you to download the pdf(link will be posted here soon). Since 1989, the USA Today Super Bowl Ad Meter has been bringing viewers together to rate the commercials on hand-held meters. There’s still time for those interested in participating go to the USA TODAY ADMETER PAGE AT http://www.admeter.usatoday.com. Superbowl 2013 was anticipated to outpull 2012 however according to Nielsen ratings, an audience of 108.4 million watched Super Bowl 2013, (more watched halftime, 110.5 million)falling 3 million viewers short versus 2012 – Superbowl 2012 game brought in 111 million viewers and over 111 million people tuned in to watch the Giants prevail with a 21-17 victory. It will be interesting to see how FOX SPORTS fares for Super Bowl 2014. Last year CBS reached a record $235.6 million in total Super Bowl 2013 advertising versus $250 million in 2012 as reported by The Fiscal Times. According to FOX 2014 Super Bowl ads have been sold out for months. Do you think FOX will outperform previous Super Bowl ads revenue? Here's the iconic, E*Trade Baby ad for Super Bowl 2013, sad they won’t be here for 2014:( Surely the E*Trade Baby will be missed by many who can't get enough of E*Trade babies. There is also a January 2012 release on YouTube of "The 25 Best Super Bowl Commercials of All Time,” in descending order (25 down to 1 last). Most on the list are repeat advertisers including PepsiCo, Etrade “Babies”, Doritos, FedEx “Caveman," Bud Light, Toyota, etc. In economic times, regardless of consumers pocket sizes, do you think famous celebrity, entertaining, etc., will be enough to get consumers to embrace the brand? Please share this with your social media and professional network. Thanks. To request a pdf of the Super Bowl 2014 advertiser $ ad spend grid(photo left is a snapshot from 2013), simply email gmbdaly [at] gmail[dot]com with "FOX Super Bowl 2014 GRID" in subject line or visit this link at ____________. All photos are courtesy of Wikimedia unless otherwise indicated. This blog will be updated regularly -- please bookmark and visit frequently. Do feel free to share your digital insights and thanks for visiting.